Last week, the Eastern College Athletic Conference (ECAC) adopted what it called “an inclusive sport strategy” that will provide opportunities for student-athletes with disabilities to compete in intercollegiate sports. The ECAC member institutions compete in Division I, II, and III levels of college sports. Sure, there are details that need to be ironed out and hurdles that need to be cleared before student-athletes with disabilities can compete for championships in a variety of sports, as is the goal of the ECAC (it hopes to contest a championship in the 2015-16 season). But the devil is in the details, isn’t it? We may have never reached this point had the ECAC or Ted Fay, the conference’s senior adviser on inclusive sport and professor at SUNY Cortland, gotten caught up in figuring out all those details first. 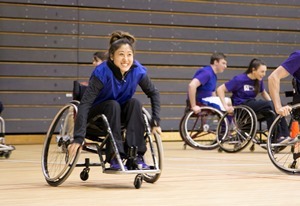 They had a plan, moved on the plan, and now disability sport has its first national governing body that is supportive of such inclusive efforts at an intercollegiate athletics level. The magnitude of this decision may not be seen right now or even at the end of next academic year when that first championship is contested. The benefits of such a bold decision in college athletics will be seen down the road, so be patient. Civil rights movements take time, and we are in the middle of one. Women once were not permitted to participate in socially important events such as sport, and in fact they still face barriers that prevent major role models from inspiring more women to play (Where is all the women’s sport coverage on ESPN or in Sports Illustrated? One would think women’s sport may not exist!). It was the same for race in sport, where young black children aspiring to play professional sport saw no role models or people that looked like them, talked like them, or were from where they were from. And we are currently seeing how professional and college athletes with different sexual preferences are becoming role models for other individuals and aspiring athletes to be comfortable sharing their personal choices – because they can still play basketball really well! The magnitude of the ECAC’s decision will be seen when young athletes will one day be able to turn on ESPNU or a conference-affiliated network and watch wheelchair basketball or wheelchair rugby at the intercollegiate level. And they will be able to truly say, “I want to be like that girl and play wheelchair basketball for my college team.” It’s marketing, and it just makes sense. Joshua R. Pate is an assistant professor at James Madison University in sport and recreation management. His research expertise is in disability sport with an emphasis on inclusion and Paralympic sport. Pate also conducts research in the area of intercollegiate athletics and sport communication. Pate has written for Ability Magazine since 2004, covering topics such as the Paralympic Movement, sport for Wounded Warriors, adaptive sport, and accessible travel. This is such a land mark decision that it effects the future of sports and inclusion. Thanks Josh!